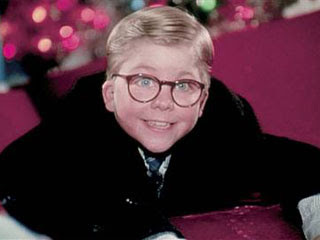 I have to admit, I love this movie and watch it every Christmas. My favorite scene? The one where the kid is dared to stick his tongue on the frozen flag pole and he's stuck there. I love it. A close second is the final scene in the Chinese restaurant and "Deck the Halls". What's your favorite part of the movie? Our gatherings this "Celebration Sunday" were to hear from the church how God worked in our lives through the 40 Days of Purpose. This was our second time (2003 was our first) to go through the 40 Days, and the impact was just as great, if not greater. The songs were celebratory. Our decoration team made the place festive with balloons. And during the message we heard from a number of believers, both seasoned and babes, about their groups, their answered prayers, their worship. Nothing pumps this pastor up more than hearing God's people tell of His mighty works in their lives. Let's live what we learned and pass it on. It was rainy today (even inside during the worship!). Thanks to our First Impressions guys with the umbrellas helping keep folks dry from the parking lot to the building. That's a great first impression! Tonight our church approved our 2009 budget at our annual church conference. Who knows how the coming economic picture will effect us, but who knows how many doors it will open to ministry and mission either? Let's be ready for whatever and show ourselves to be faithful and useful to our God in our community and world. 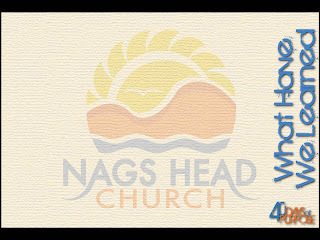 Tomorrow we'll celebrate by hearing from many what God has done in their lives the past six weeks of 40 Days of Purpose. There will be some great testimonies of God's grace and we'll have a lot of fun. See you at 9 or 11. Dale is a good friend and one of our church family. Currently he is attached with an army battalion in Iraq. Two years before the more famous Thanksgiving at Plymouth a thanksgiving proclamation was made in the colony of Virginia. Before football. Before "Black Friday". Before Macy's parade. Before it was a holiday it was a holy day. The proclamation read: "We ordaine that the day of our ships arrival at the place assigned for plantacon in the land of Virginia shall be yearly and perpetually keept holy as a day of thanksgiving to Almighty God." "Holy" means set apart for God. So at the least we should not forget to Whom our thanks is owed. You were made for a mission. That was the theme today. As Christ followers we've been commissioned and sent to share the Good News with those who don't yet know Him. I took a poll and got an amazing response: everyone who knows Christ attributes that to another person introducing Him to them. Hello. Today we included lots of graphics of those our church supports in other places to do just that, along with a couple of video greetings and one in-person greeting from them. Thanks to our missionaries for sending pics and videos. We also had our Hukilau Surf Camp van outside loaded with surfboards and wetsuits (thanks Steve); the NC Baptist Men's Disaster Relief van stocked with tools (thanks Greg); Kathy from Pathways International - a local outreach to the hundreds of international students who come here to work each summer; and the Bensons from Honduras. Also included were graphics from many of the local outreach things we do here. The MP 13 Band led us in songs that reiterated our purpose of daring, caring and sharing. One new song, "The Power of Your Name" (Lincoln Brewster) followed up the teaching perfectly. We're learning more and more of the need to not only believe the right stuff, but to demonstrate the love of Christ through practical means. It's a relatively new term to me/us, but God is growing us as we become more intentionally "missional". After completing two worship gatherings we switched gears, had lunch (thanks Hospitality Team) and interviewed four new partners in our fellowship. There are several adults awaiting baptism, so we've got to get that in soon. Another fantastic day! 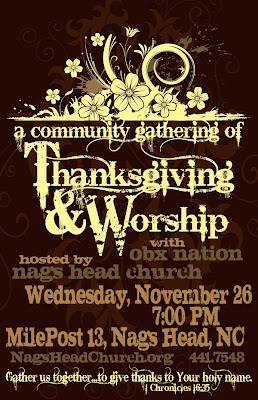 And Wednesday night we'll worship and give thanks together again with a special Thanksgiving gathering. Today at our yard sale I was approached by a man who said he wanted to ask me about our church. "Sure! ", I said. I'm always excited to answer sincere questions. 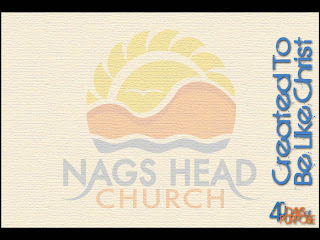 But he really didn't want to ask about Nags Head Church. What he wanted to do was "educate" me about the "new world order". Him: "Have they contacted you yet?" Him: The "new world order". Me: "And who is that?" Lots of nebulous answers to my questions. All the while he's holding a copy of Christian author Larry Burkett's fictional novel "The Illuminati". It had been sitting in a pile of books on sale. "You need to read this", says he. "It's all in here. This is the most important book you'll ever read." "How about the Bible? ", says I. "OK. After the Bible it's the most important book...". "But this book (Illuminati) is fiction." I'm wondering where he's going from here. "Yes", I said, taking the book from him and turning to the author's intoduction page. "Look right here. He says it is 'purely fiction'." His response didn't surprise me. Conspiracy theorists have the answer to everything, even when the facts refute them. "He had to say that in order to get it published." Right. Burkett was willing to risk his life's work under the pretense of a lie? I think not. He was a man of integrity and character. Then he asked, "Do you know what they're going to do to you? They're going to exterminate you." I said, "That's OK. I know where I'm going and Who wins in the end and Who is in control." "And", he continued, "they're going to exterminate your church". He didn't care for my answer. "That's all right, too. We're citizens of another kingdom and this life is just dress rehearsal for eternity anyhow. God's got a plan and His plan wins, not any 'new world order'." Everybody believes in something, don't they? I've heard his fables before. And even if they were true, God is sovereign. Any "new world order" will one day be replaced by a kingdom yet to come. For that reason I don't have to live in fear of what may or may not happen. It snowed all morning on the Outer Banks of North Carolina. The temps are 15 to 20 degrees below normal. Global warming has me confused. Today was our annual Ministry Fair at NHC, and I thought it was the best ever. Tom Lee, our Pastor of Ministries, along with a lot of help, put together the "fair", which profiles all of our 25 ministry teams and encourages involvement. It's not the only time we focus on serving God by serving one another during the year, but it is the the big push every year to get new church members to plug in. And cool iServe t-shirts, Tom! 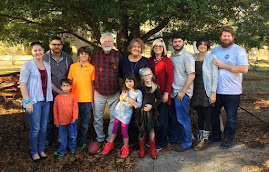 Instead of a "full-length" sermon today I spent 20 minutes of my time interviewing Mike and Tina, a couple who volunteer and are leaders of the Children's Worship team (Tina) and the First Impressions team (Mike). They get it, and our hope was their passion for serving would catch on with those who might be standing on the sidelines. I think they did an awesome job of sharing their stories. Our Video Production Team put together an outstanding video that highlighted most of our teams. It did a great job showing how much joy there is in serving others. A few weeks ago we were bummed that our Krispy Kreme source was no longer going to be there. But then Starbucks stepped in with bagels, muffins, etc. And Kellys keeps sending the sweet potato biscuits. God is good! I don't know how it is that to me it seems every week at NHC gets better and better. But it does. Our church has such a joy and passion for getting together. This truly is dress rehearsal for eternity. 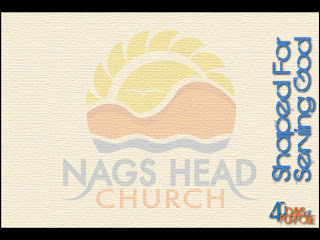 And next week our focus is missions. Can't wait. 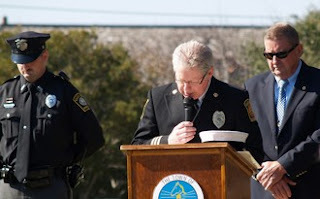 It's not quite the cover of The Rolling Stone, but this pic is on the front page of the Town of Nags Head's web site today with this caption: Nags Head Fire Chaplain Rick Lawrenson gives an invocation during the Veterans Day ceremony held at Town Hall on November 11. Walter D. Fillmore, Brigadier General (Ret. ), US Marine Corps, was the guest speaker. More photos can be found under News & Information. Happy Veterans Day! Thanks to all who have given years of their lives and in the prime of their lives to defend and protect the freedoms we value and love. And to those currently serving, especially in the Middle East, may you come home safely, soon and to a grateful nation. The Marine Corps is a part of my heritage. And one that brings me pride. Dad went from the reserves to active duty when I was three. I grew up watching him clean his rifle, spit-polish his boots and shine his belt buckles. I remember when I was, I don't know, five or six, how ecstatic he was when he was promoted to sergeant. I've had my share of "high and tight" haircuts from the PX barber. We saw him off to a year in Okinawa, then two years later to a tour in Viet Nam. But it goes farther than my dad. My great-grandfather (mom's maternal side) was also a Marine. He lied about his age and as a 16 year old joined the Marines and served as one of only 500 sailors and Marines in China over 100 years ago during the Boxer Rebellion. I have fond memories of Pop sharing his personal pride in being a Marine. A cousin still has Pop's uniform, in mint condition from his days as his company's bugler. So to all the Marines, past and present, Happy Birthday. You are the few, the proud. I got up at 5AM and was at the Fire Station at 5:30 to grab a cup of coffee, a Sonic sausage and cheese sandwich and get instructions for traffic control duty for today's OBX Marathon. FF Kidd and I were at our post at 6:00, which was conveniently at the corner of Soundside Road and Croatan Hwy, and the location of Nags Head Church. After 4 hours of directing traffic and drinking coffee I had to be excused to get ready for my "day job". I volunteer with the fire department as their chaplain, and this was a great opportunity to give back. Thanks to our Hospitality Team (Barbara, Les, Carol and Cindy) for coming in early and setting up a coffee stand for spectators. It's another way to reach out. 5,000 runners and not that many spectators came by us this morning before church started. We only had one gathering this morning due to the congestion the Marathon causes. So it was a full house crowd and with lots of energy. Everything was crowded today, but that's a great sight. So here's a special shout out to our First Impression team for getting extra seating up as we filled up; to our Hospitality team for keeping up with the coffee and pastries; and especially to our Childrens and Nursery staff for handling the double dose so well. Today I talked about God's 3rd purpose for our lives: discipleship. God made us to become like Christ. That's a lifelong process involving changing our character. The focus today was on the things we don't normally think about as tools God uses: trials that He designs to help us; temptations Satan throws at us to hurt us and trespasses against us by others that hurt. God uses them (Romans 8:28) to teach us to trust, obey and forgive. Easy? No. But no one who is a Christ follower (something about taking up your cross) would describe the Christian life as easy. Great songs complimented the message today as usual. Our band does a fantastic job tying in just the right music with the message before and after. We're again partnering with Samaritan's Purse with Operation Christmas Child. I don't know how many years we've done this - 12 or 13 I guess - and the response is always great. A short video today explained it. If you don't know about it, check out the link. We gave a shout out to our Veterans today. Freedom isn't free. Thanks to all who have served and are serving our country in our military. If you get a chance Tuesday, attend a Veterans Day ceremony. And Semper Fi to all the Marines out there as you celebrate your birthday tomorrow. Billy Graham is 90 today. What's happening this month? Watch this! It’s November 5. And as the old song from “The Poseidon Adventure” sang, “there’s got to be a morning after”. I realize that today’s news is likely captivating the attention of the majority of us who read this paper, so I don’t have any grand illusions that what a preacher writes today will gather much attention. But I want to speak to the Christian community in the aftermath of yesterday’s much anticipated vote. There are some biblical principles that need to be remembered by us who claim faith in God regarding government and our responsibility to it. So whether this morning’s news makes you smile or kick the cat, these should apply to you. And take a minute to break out your Bible and read the passages I’ve included. Human government isn’t perfect, but it is a God-ordained institution. Perfection was tossed out the window in the Garden of Eden. (Genesis 3) Whether your candidate is viewed as some kind of a messiah or the lesser of two evils, he isn’t going to usher in utopia. Yet God has created government to protect us from harm and to provide justice. (Romans 13:1-7) If our government misses those marks it will answer to God. We’ve heard from all the politicians and pundits that our government is “broken”. Well, it was never perfect, not even when the ink was still drying on the Bill of Rights. (I will interject that it’s still the best the world has to offer!) Broken people can’t produce anything perfect. So, as God has done toward us, let’s extend a little grace. Sometimes we get what we deserve. Over and again when the nation of Israel in the Old Testament turned its collective heart away from dependence on God they found themselves in dire economic times. What’s a better wake up call? Unfortunately the American church in the last generation has tried to enact spiritual awakening via political and man-centered means. And judgment, we’re told begins in the “house of the Lord”, and rightly so. (1 Peter 4:17) Before we try to clean up our country we need to clean up ourselves first. You have a dual citizenship. (Philippians 3:20) By God’s grace you are a citizen of a coming Kingdom. A perfect government is in our future. We just have to wait and be patient. The answer to all our ills is not in any man who occupies the Oval Office, sits on Capitol Hill or dons a black robe. Let’s hope things get better. But whether they do or don’t, your future is a bright one if Christ is your King. Our responsibility is to pray for our leaders. (1 Timothy 2:1-2) Whether your man won or lost, it makes no difference. He needs your prayers. Why? “The king’s heart is in the hand of the Lord” (Proverbs 21:1). God is the only One Sovereign in the truest sense. He’s got things under control, whether we can see it or not. 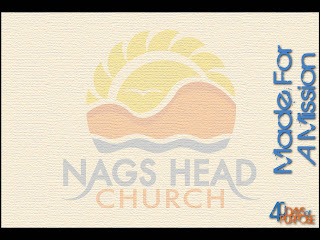 Rick Lawrenson is the Lead Pastor of Nags Head Church. I've heard a lot of people talk about their "right" to vote. I'm no constitutional expert, but I think it's more like a privilege than a right. Kind of like getting a driver's license. Got there early. At 7:15AM. Stood in line about 25 minutes, which was far longer than ever before here in Kitty Hawk, and I've voted here since '92. I did inquire as to why no one asked to see any ID. All I had to do was give my name, my address and sign an paper saying I was me. The answer was that in NC identification is not required. How stupid is that? My daughter Sarah is registered in her state of residence and voted there. Yet her name was below mine in the local registration. 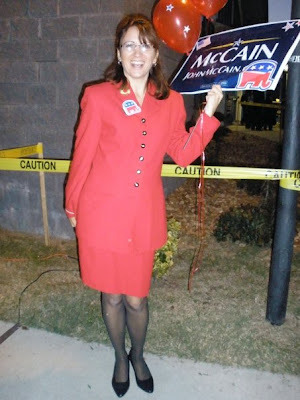 My wife could have come back and voted as Sarah and unless someone knew she was not, "Sarah" would have "voted" twice. I wonder how much this is happening... I'll try not to lose too much sleep over it tonight. Then I got an email telling me that a friend's entire batallion in Iraq has not been able to vote because someone over there dropped the ball in getting ballots to them. Guys (and gals) are asked to be willing to fight under our flag but haven't been able to vote to choose their next Commander in Chief. How wrong is that? So, despite all our technology we're still not much more than a banana republic when it comes to counting legitimate votes, it seems. I'm glad my faith is not in America but in a God Who has it all under control. Yet, (before some of you crucify me), this is still by far the greatest nation on earth. 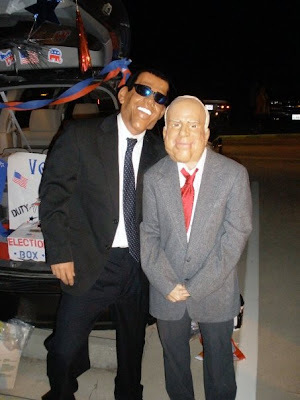 At our annual Trunk or Treat event last night over 400 family groups visited. There were inflatable rides; fun games; over a half-ton of candy given out; free food and drink and all in a safe family environment. Was it expensive? A little. Did it take a lot of work? Yeah. About 80 volunteers from our church made it happen. Was it worth it? Along with the 1,000 children who had an incredibly fun night there were another another 500 or so adults who witnessed a church giving back to the community. Everyone was smiling. Where do you find that anymore? Every family received a printed presentation of the Gospel. Every family was welcomed and told "Thanks for coming. We're glad you're here!" And they heard that without being asked for anything in return. "Wow" was a frequent response. The whole event screamed loud and clear, "This church loves kids and their parents, knows how to have fun and do it in an excellent way". At least one that I've heard from so far was able to share his personal faith story for the first time in a long time. Once again "TEAM" was emphasized as a huge part of being a church.